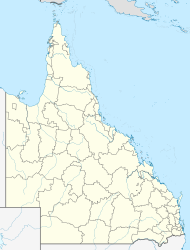 Rosewood is a small town and locality in the Bremer Valley, Queensland, Australia. It is within the local government area of City of Ipswich. The town of Rosewood is located 61 kilometres (38 mi) west of the Brisbane CBD. At the 2016 census, Rosewood had a population of 2,834. Part of the town's border is marked by the Bremer River to the south, and the decommissioned Marburg Branch railway line on the Little Liverpool Range to the north. The origin of the suburb name is believed to be derived from the Rosewood (Acacia harpophylla) or the Dysoxylum (a Mahogany species, referred to locally as a rosewood despite bearing little relation) tree or shrub, both commonly found in the south-east Queensland region at the time of Rosewood's settlement. The first coal mine in the Lanefield district, west of Rosewood, commenced production in 1918. As part of these workings, two railway branches from the Brisbane to Toowoomba main line were constructed to the mines at Lanefield Colliery (1934 to 1965) and Westvale Colliery (1929 to 1960). The New Oakleigh Mine is located to the town's north and was one of the last remaining coal mines in the area at the time of its closure in 2013. Rosewood is the terminus of Queensland Rail City network's Ipswich and Rosewood railway line. Rosewood railway station provides commuter rail services to Ipswich and Brisbane via Ipswich. Translink also provides bus route 539, which terminates in Rosewood. The route services key Lockyer Valley centres, such as Laidley, Gatton, Grantham and Helidon, to the west of Rosewood. The Ipswich City Council operates a fortnightly mobile library service which visits John Street. The Rosewood branch of the Queensland Country Women's Association meets at 4 John Street. ^ a b Australian Bureau of Statistics (27 June 2017). "Rosewood (State Suburb)". 2016 Census QuickStats. Retrieved 27 June 2016. ^ a b "Rosewood - town (entry 29071)". Queensland Place Names. Queensland Government. Retrieved 17 January 2014. ^ "Rosewood - locality (entry 45100)". Queensland Place Names. Queensland Government. Retrieved 1 October 2015. ^ "Rosewood Railway Museum". Australian Railway Historical Society - Queensland Division. Retrieved 2017-02-02. ^ "NOMENCLATURE OF QUEENSLAND—253". The Courier-Mail. Brisbane: National Library of Australia. 22 July 1936. p. 14. Retrieved 17 January 2014. ^ Milne, Rod (March 1987). "Colliery Branches of the Lanefield District". Australian Railway Historical Society Bulletin: 62–66. ^ "Rosewood Police Complex (entry 601101)". Queensland Heritage Register. Queensland Heritage Council. Retrieved 9 July 2013. ^ "Glendalough (entry 600735)". Queensland Heritage Register. Queensland Heritage Council. Retrieved 9 July 2013. ^ "St Brigids Church (entry 600736)". Queensland Heritage Register. Queensland Heritage Council. Retrieved 9 July 2013. ^ Roads, TransLink Division, Department of Transport and Main. "Route 539 | TransLink". TransLink Division, Department of Transport and Main Roads. Retrieved 2017-02-02. Wikimedia Commons has media related to Rosewood, Queensland. This page was last edited on 17 January 2019, at 01:22 (UTC).